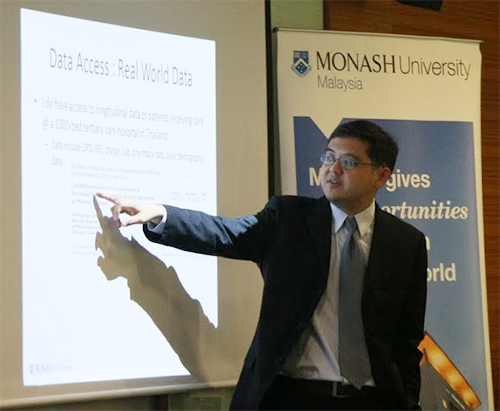 Prof Chin was the first speaker in the second installment of PechaKucha, a series of concise lunchtime talks organised by the Professors Advisory Group (PAG) that introduces the audience to the range of disciplinary areas covered by Monash Malaysia’s academics. Meaning ‘chit chat’ in Japanese, the presentation format is 20 slides displayed for 20 seconds each, to be presented in just 6 minutes and 40 seconds. In his presentation entitled ‘Why East Malaysians are unhappy?’, Prof Chin revealed some reasons for the discontent in East Malaysia and their desire to secede from Malaysia. These reasons included the government not giving them the parliamentary seats they deserved when Singapore seceded from the Federation of Malaysia, granting citizenship to illegals and syphoning natural resources without investing the wealth into developing the two states. 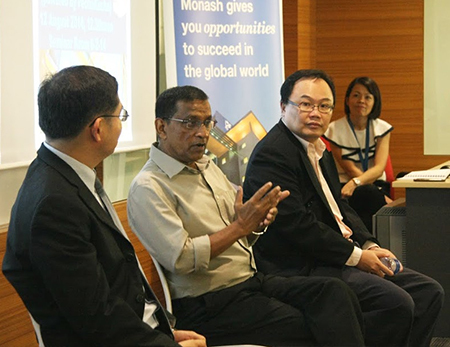 Professor Gamini Herath, Director of the Social and Economic Transformation in Asia (SETA) research platform, brought up the economic, social and environmental side effects of development in his talk ‘Economic Development of Asia; “What development?”’ Expounding on poverty, pollution, sickness, destruction of biodiversity and even pointing out that “600 million people defecate in the open in India right now”, he advocated for sustainable development. Third speaker Professor Nathorn Chaiyakunapruk, whose background is in pharmacy, described his research interests in the economics of health care, drug safety, and meta-analysis in his talk ‘Health Economics and Outcomes Research’. The talk ended with a Question and Answer session and some thoughts from the floor. PechaKucha will be held once a month during lunch hours, featuring three speakers each time.